When it comes to popcorn, I’ve always been an Orville Redenbacher kind of girl. I think it was an early association I formed with my grandpa, whom I shared many a bowls of popcorn with, and who – coincidentally – also happened to be named Orville. I’ve tried my fair share of bulk co-op popcorn over the years too, but I often find myself reverting back to Orville’s famous gourmet popping corn. It still thrills me to open that vacuum-sealed jar. I can’t, however, say that I notice much of a taste difference between the two (sorry Orville). As long as there is a full jar of popcorn on the shelf, I’m satisfied. Satisfied, that was, until one night last winter when my friend Danielle came to dinner. She brought her husband Jon along too, but almost as importantly, she brought us a jar of her uncle’s homegrown popcorn. It was a striking mix of ruby red and golden yellow kernels. I put it on the pantry shelf and it seemed to positively sparkle next to the neighboring jar of Orville Redenbacher’s. It was so pretty that I actually put off popping it for quite some time. But when I did, I was forever changed. The popped kernels, albeit slightly more petite than Orville’s, were light and crisp with a freshness that I am sure I have never experienced. And the taste. It tasted like, well – corn. Sweet and creamy and crisp all at the same time. I managed to stretch out the contents of the jar through the winter – supplementing with Orville’s and selfishly saving the good stuff for nights I knew my husband would be away. And in January when the garden seed catalogs started pouring in, I curled up on the couch and got serious. I settled on Pennsylvania Dutch Butter Popcorn. I am frequently swayed by the word “butter” in descriptions, and this was no exception. And so this past summer, for the first time in my 17 years of gardening, I dedicated a corner of our plot to popcorn. I planted three four foot diameter circles two weeks after the sweet corn went in to avoid cross-pollination. I had a few setbacks over the summer, including a raccoon incident on a weekend we left town, and several discouraging remarks from friends saying they had tried popcorn in the past, but never found our growing season to be long enough. But I kept the faith and tended my circles. I shored up the breach in the fence, and was graced with a long, sweet fall. Shortly before out first frost on October 29, I harvested one full jar of corn. 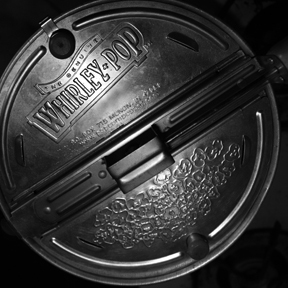 Still not entirely convinced of my success, I put a handful of kernels straight into the Whirley Pop. And sure enough, it popped! And the taste? Even better than I remembered. I’m already scheming how to fit more popcorn circles into next year’s garden. I prefer to pop my popcorn in hot coconut oil and top it off with nothing but a sprinkling of Penzy’s Garlic Salt. 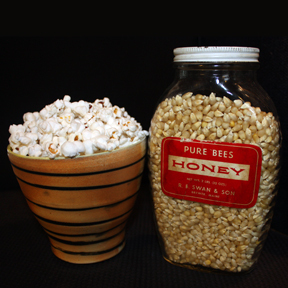 But I also have a favorite honeyed-cayenne popcorn that I like to make for special occasions. It’s a great appetizer to serve at dinner parties – a little unexpected, but still sophisticated. In fact, I think it would make a lovely Thanksgiving Day hors d’oeuvre. Snoopy would be so proud. A few notes on the recipe. I adapted this years ago form a recipe I clipped from Cooking Light. The original recipe calls for pure maple syrup, but since I have more bees in my possession than maple trees, I tweaked it to use honey. Both are quite good though. Omit the water if you go the maple route. I also increased the amount of corn for a better popcorn to syrup ratio. You can vary the amount and type of chili pepper. I have settled on 1/4 teaspoon cayenne as my favorite. It makes a fairly spicy snack, but the honey balances it perfectly. Use less pepper for a tamer treat. A rounded half cup of kernels yields about 12 cups of popped corn. I always toss a little extra in the popper just to be sure, and am generally left with some to snack on while I cook. Depending on your popper, you might have to pop in two batches. This recipe is easily halved, but the full recipe is a nice amount when there are a few guests mingling about. It also stores for a week or so in an airtight container. Rub a bowl large enough to hold the popped corn lightly with butter and add popped corn. Heat the honey, water, butter, salt, and cayenne over medium heat in a small heavy sauce pan. Stir until everything is just combined and then let it come to a boil. Let the mixture boil without stirring for 2 minutes. Pour the hot syrup over the popcorn and stir to coat. 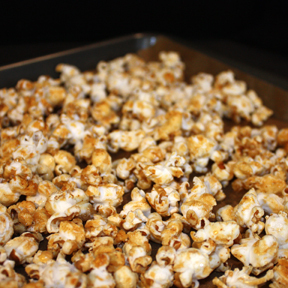 Line 2 heavy rimmed baking sheets with parchment and spread the popcorn between the two pans. Bake in a 300º F oven for 15 minutes, flipping and rotating the two pans halfway through. Remove from oven and let cool completely. The popcorn will crisp up as it cools. Glad to see some one else like cayenne on their popcorn, Jude thinks it’s terrible. I just use olive oil with cayenne, or chipotle and some cumin. I kinda like the smokey flavor of chipotle and cumin best. Ooh – yes, chipotle is always a winner in my book. I like the addition of cumin – I’m going to have to try that!